The orchestra consists of robot drummers that play steel drums “live”, under the direction of a performer. The interactive rhythms of the OMM sound out the movement, work and machinery of Turin industry. The subtext moves along the lines of the “Nag Hammadi”, the third-century A.D. Gnostic text, before plunging into contemporary mythologies through pieces inspired by the works of Ballard and Burroughs, exploring the relationship between, and the fusion of, human and machine. The theme of Share 2009 is Market Forces. The Share Festival in 2009 showcases works about complexity. “Market Forces” responds to the crucial contemporary concerns which affect us all. These works explore what happens when we connect things together into systems and set these systems into motion – questions of chaos and value, meaning and randomness, politics and economics. These unstable abstractions have a concrete effect on our daily lives. Share Festival will also be featuring the international collective for synesthetic media, : Optofonica”, created by Maurizio Martinucci aka Tez, who lives and works in Amsterdam. Among the numerous artists working with the collective, the Festival will be presenting Tez, with his performance “pv868”, “Martis Fennis” and Evelina Domnitch and Dmitry Gelfand with their work “10000 peacock feathers in foaming acid”, a performance using a soap film and laser. The /OSC (Optofonica Surround Cinema)/ will also be a feature of the night. 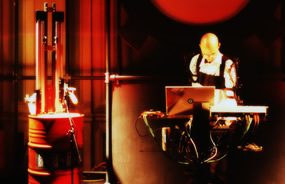 Wayne McGregor; Teho Teardo is an Italian composer and musician. After having released a fourth album with Meathead and having worked with Mick Harris (Scorn, Napalm Death) and Lydia Lunch, Teardo now composes music scores for film and television.